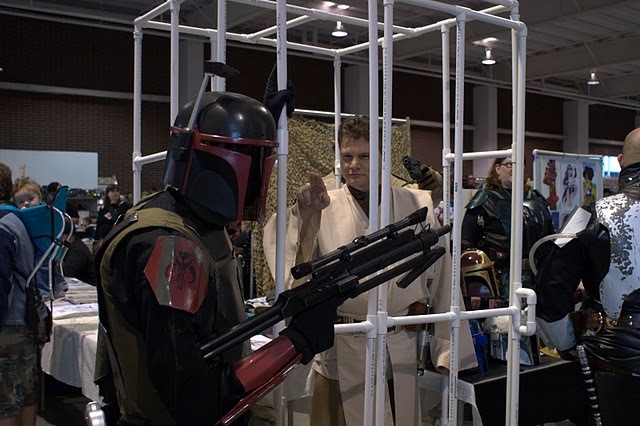 After a fantastic weekend of trooping and droiding I am sick once again. Here are just a few of the many pictures taken. Later this week when I collect them all I will make a video of them. Look sir! 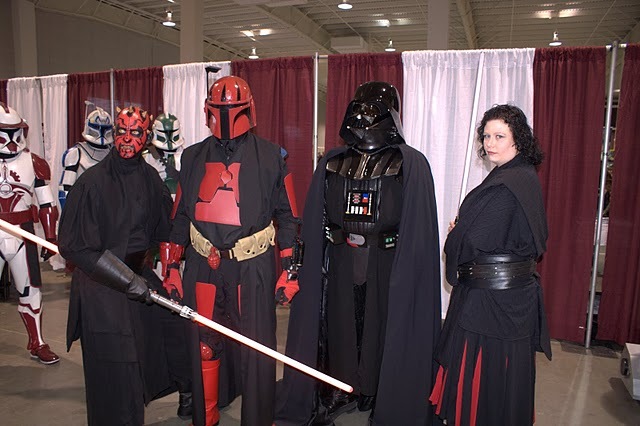 We have Sith! Give me back my wallet! All Photos taken by Denny Freeman. Thanks Buddy! With only two hours today and 5 hours tomorrow I started painting T3. I only got his head done plus I got a cram the rest of the painting in the morning and put him together before 6pm for an event. Hope I can make it! 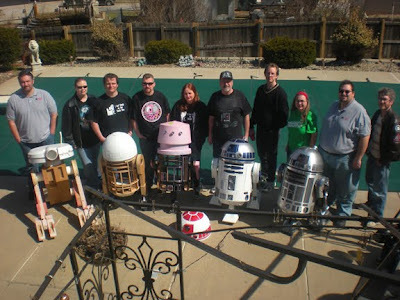 Today we celebrated two years of building droids. Only a few droids could make it as the others are getting ready for other events. R2-D2 was happy to have some friends over. LC made this R2 cake for the event all by himself. We had some BBQ and chatted about building and events. 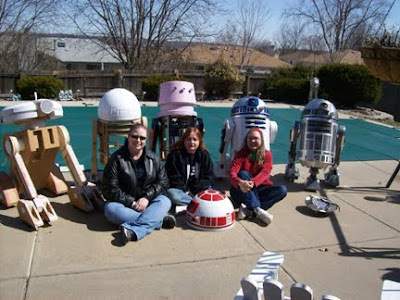 Here are the three lady builders with the droids. WOW sun and no snow for a change! All the R2 builders in a row. 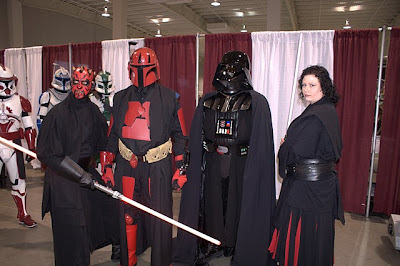 Jawa Jaka came down all the way from Colorado to help out with the event and come to the anniversary party. She took the new shop for a spin by doing some caster work on her R2-AL before the event. Lots of people at the event. The droids put on a good show. Rob and Ben from the 501st came and lent a hand. Thanks Guys! Ben is getting the fever for the flavor of an R2. Jaka and Al manning the booth. T3 following Mom and Dad around. 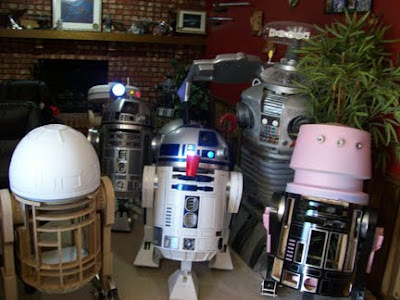 Group shot of the droids with their owners. I was going to sand and paint Patches' legs today but the garage had so much stuff thrown around and no light, I could not get to anything I needed. So I decided to get the space in some kind of order and beef up the security. Denny came by and we took a trip to the store where I got this new steel door. The old door was falling apart and I did not like that it had windows. I also put wire mesh over all the windows so that even with no glass no one can get in. 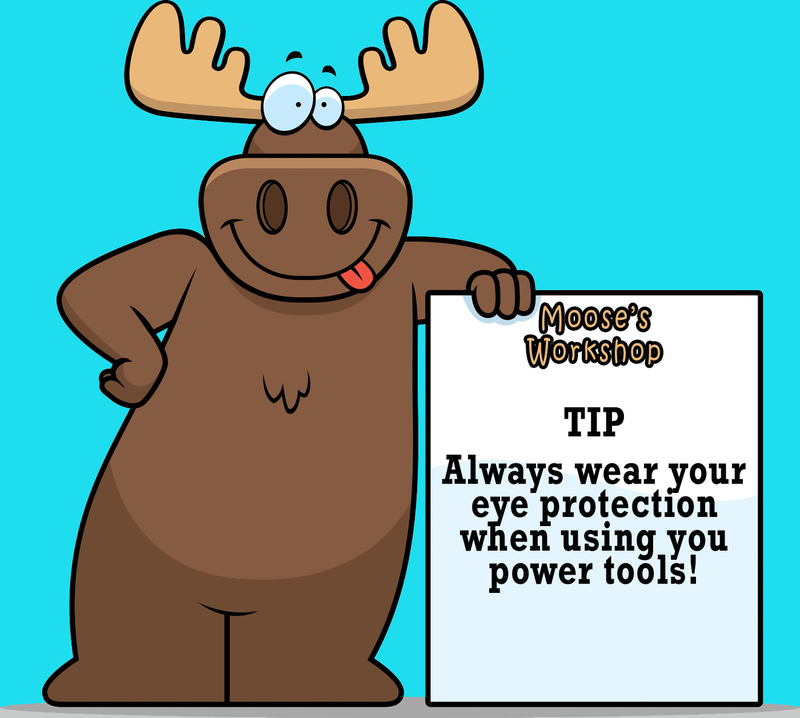 There are some other security features I did as well but it would be stupid to blog about them. Here the garage is cleaned up and a little organized. Even with help it took all afternoon. We took out three trash can loads of junk and two bags of leaves. I also got all the original lights working in the garage plus we hung one of the florescent lights from the old BARN. I will wire that in later. Even with the TARDIS, boxes, and shelves that need to be gone through I can still get the trailer inside. If the snow holds off tomorrow maybe I can at least get some primer on Patches' legs. Today I got the ankle pieces glued back on, the end grain re-sanded where it was re-glued, and the first coat of Bondo put on. I also got most of T3's urinal...er crate put together. Not much done today. I put screws around the perimeter of the legs and put the first coat of bondo on the screw heads. I also put a few more screws R3's legs as well while I was at it just for the heck of it. Monday I hope to start sanding . Instead of being mad about the legs splitting I decided I will do a more in depth step by step on how to fix this problem with the legs if it happens to anyone else out there. I started by removing all the painted parts from the legs that could be damaged by the clamps. Then I removed the motor holders. Dawmer came by and helped me flip R2 over on hid dome ring. Here are a few of the parts I took off the legs. I can't believe I have him this far back apart again after only a week. At least now I can fix the servo that is behind his leg as well. Brad came over as well to lend a hand and we took the leg parts down to the workshop. I wedged a screwdriver in the crack and pulled it apart. We dripped glue in and I brushed it all the way down inside covering the surfaces as much as possible. Then the cracks were clamped together and set aside to dry. Tomorrow before I take the clamps off I will add some course thread drywall screws around the perimeter to enforce everything. Then I will start on the cracks on the bottom side of the legs which are very small thankfully. Riding in the back of a truck or trailer has taken a tole on Patches. Unlike all the other R2 legs I have built Patches' legs were purchased from the club. The thin layer of paper board used in the kit has de-laminated over time and split in two. Not the best material to use in something structural. (Not saying the club legs are not great, just that I would add screws to them as well when you put them together.) The legs I make now have no such paper layer and they are nailed and screwed together so they should not have the same problem. I plan to take R2-CM's legs off tomorrow and get as much glue as possible into the splits them clamp them together. Then I will put a ton of screws through them to hold them together like my other legs instead of depending on the wooden dowels that can loosen over time. While I have the legs off I am going to go ahead and do the finishing work along with R3's legs. 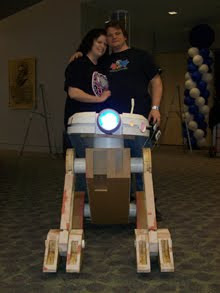 This weekend Brad Syrena, Jen and I hauled the droids 150 miles to help out with the Iowa Kidsfest event. 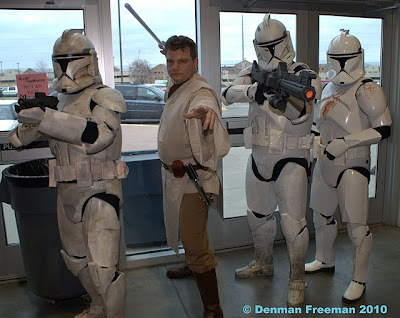 The 501st, Rebel Legion, and us R2 builders were there in force (no pun intended) to show everyone in attendance a great time. Brad's R2 and my R2-CM hit the ground running, stoping for tons of pictures wherever we went. Patches even took a picture with these two Lovely leather bound ladies. Jen and Tia. Shannon from the surprise Hockey game proposal last week finally got to meet the droids. At the end of the day Brad and R2-CM went on stage to do a skit with the 501st. The video of the skit as well as more pictures will be posted tomorrow evening. It was a great event with a great group of friends from the 501st and Rebel Legion. Some more resin parts came in today, now R3 and R4 have data ports. The next order of motors belts and wheels came in to fuel the army. I will keep one set as a spare or use them for K-9 later. My newly painted boosters are mounted as well as my custom speaker set up. With the new speaker set up I had to relocate all the innards again. Talk about time consuming. Started on the floor section of the crate. I had to make some adjustments to the size so it fits in the new trailer. Now to trim the floor boards up and build the sides. Except for the bling pieces on the side this mouse is done! I will take him for a test spin tomorrow :D Now to finish up the scrubber! The tempature outside finally got above freezing and the sun was out so I decided to paint my mouse droid. Here it is drying in the sun with it's wheels off. I also started on a crate for T3 to be hauled in.